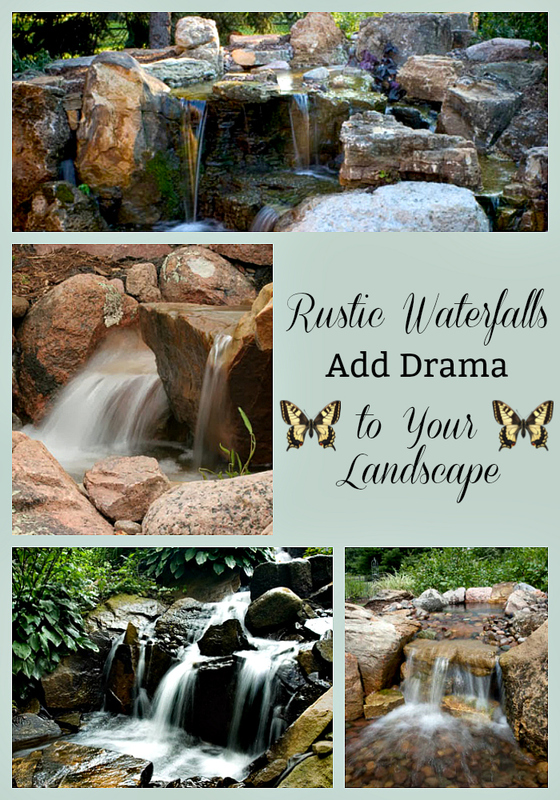 Rustic Waterfalls Add Drama to a Landscape - Aquascape, Inc. Most people who want water in their landscape choose the sound of a waterfall as the number one choice for their desire. Backyard rustic waterfalls can take the shape of small, babbling brooks or loud, thunderous falls. Rock choice makes a big difference in the appearance of your waterfall, and many homeowners choose a rustic appearance for their water feature. Cool, dark rocks create an air of intrigue and mystery to this suburban backyard water feature. Note how the water is divided between the crags of the rock as it flows downstream. Rocks lend an architectural element to a waterfall and should be chosen carefully. Often, a pond installer will re-position a boulder several times until the right look is achieved. Even a small rustic waterfall such as this one can add drama and an air of rusticity to the landscape. By the looks of the moss and worn appearance of the rocks, you’d never know this is a new backyard waterfall. Ask your pond contractor to choose rocks with moss and an aged appearance if you want a rustic look. Man-made rustic waterfalls should look like it’s always existed in the landscape. Choose your installer wisely to get a natural looking waterfall as opposed to a pile of rocks stacked willy-nilly. You’ll wind up with a beautiful waterfall that looks like Mother Nature carved it herself!